From the ESRI UC 2009 Plenary Session. US Census Chief Geographer- Mr. Timothy Trainor - announced the successful completion of the US Census 2010 Address Canvassing Project - "by far the largest deployment of mobile GIS in the World ". The Address Canvassing project utilised over 140,000 enumerators and canvassed 145 million addresses in every street of the U.S.A. - HUGE numbers! As a testament to the strength of the project planning and execution , which included ArcPad and the ArcPad team over many years, Mr Trainor announced that the very tight schedule of 11 weeks had been not only met but better by 7 days. A common field data collection requirement is to automatically store the field worker's name in an attribute. This allows captured/edited features to be traced back to the field worker responsible for the captured/edited features. This sample applet demonstrates one approach to supporting this requirement. 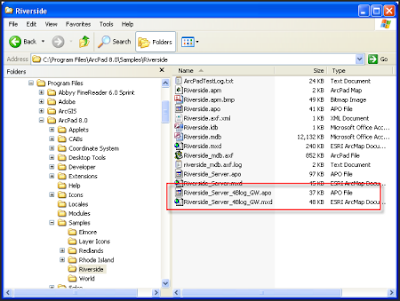 Copy the applet files (Login.apa, Login.vbs, Logo.jpg, UserNames.dbf) to the ArcPad applets folder and start ArcPad. Watch Elvin being interviewed by Very Spatial crew. ArcPad now has the ability to synchronize data directly with ArcGIS Server out of the box! No coding or development environment required, just a couple of wizards! On Friday 9th May 2009 we published an instructional blog to show this capability of ArcPad. This blog will talk in more depth about the benefits of providing this functionality. Organizations that have already invested time, money and effort in deploying standalone ArcPad projects can now set up Server synchronization with little or minimal change to the original project and workflows. So, let’s go into these points in a bit more detail. We were aware that many users that have previously created ArcPad projects that may have, in many cases, extensive customization within the AXF from custom forms to automated calculations. So if you want to (or have) migrate your personal geodatabases to the ArcGIS Server environment you can take ArcPad with you! 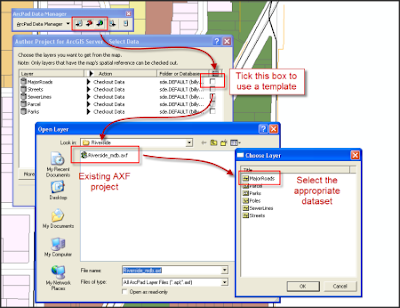 Within the ArcPad Data Manager you have the provision to use previously created ArcPad AXF’s as a template to extract the data/schemas from the server environment. When you do this, all of the customizations that have been previously set up will deploy in the new AXF. If you want to create an AXF with datasets that have previously been in separate projects you can also link to several AXF’s as templates which is a very powerful benefit. When you install the ArcPad Server Extension a folder called ArcPadPublications is installed in your \ArcGISServer\ (on your AGS machine). Once you have processed the mxd for Server an APO file is created next to the mxd (see pic). In ArcCatalog (as the previous blog entry shows) you can now set up a Map Service with ArcPad functionality (different to Mobile Data Access). Once the map service is set up working in ArcPad is business as usual. Users are merely going to download data from the server (using the Add data from server) rather than have it stored on a card or the device*. Once data has been edited within ArcPad, users simply post the changes using the “Synchronize data with ArcGIS Server” tool (once again see blog below). *This is the standard approach however the next topic will discuss some different methods of deploying data for ArcPad. Most people refer to “mash ups” within the world of web pages and collating information from different locations. So why did I choose to use the buzz phrase? Well, ArcPad allows users to mix the variety of check in/out methods that are available to tailor a robust method to get data in and out of mobile, desktop and server environments easily. Previously I mentioned how users can deploy an AXF through the server environment and that from ArcPad you can update the server through live synchronization. What if you were a user that had a device that had no network communication (such as 3G) or in a remote location with no coverage? Obviously in both scenarios no one can update to the server directly, so ArcPad allows the functionality to still check in the data using conventional methods i.e. connecting a device to a desktop computer (not the server) and running the standard check in process available. This means that field workers have a lot of flexibility in the way communicate between ArcPad and ArcGIS when they want to submit there data. Apart from the ArcPad Data Manager, ArcPad installs its own Toolbox that can also help with distributing datasets. The check in/out processes can be written as part of a larger geoprocessing tool that organizations may have already built that process and analyze data. Now the model can process, analyse and distribute in one process. Finally, here are some other distributing data methods. If you don’t want to use server to synchronize data automatically (or if you don’t have the license), you can create deployable CAB or ZIP files. Depending on the environment you are deploying too will determine which you choose – CAB for windows mobile and ZIP for desktop/tablet environments. If you have the appropriate software, data can also be added to these files to make a single install such as applet files that might have some custom tool buttons to use for a project. As you can see there are many methods that you can use to deploy data to devices through manual processes, but with minimal configuration of enterprise data and ArcPad projects you can rapidly get your existing work flows up and running within the ArcGIS Server environment without using a single line of code! For more information on these topics please head to the Online ArcPad help documentation and see the ArcPad Data Manager section or even post a thread on the ArcPad forum on ArcScripts. 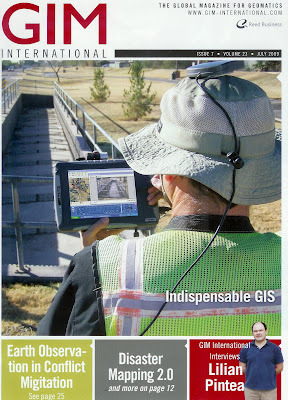 Check out the cover of the latest issue (July 09) of GIM International magazine. With the release of ArcPad 8.0 Service Pack 1, comes additional support for USB GPS Devices. In response to users requests, ArcPad 8.0(SP1) now has improved detection of both Bluetooth Serial Port or generic USB GPS Serial Port devices using the NMEA, TSIP or SiRF protocols. This represents a significant advancement in GPS support for ArcPad Users. 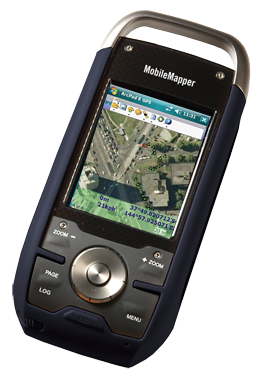 SP1 now allows users to plug in USB GPS devices and, using the find GPS tool in the GPS Preferences drop down, search, locate and list these additional devices. After plugging a USB GPS device into a USB port on your PC, start ArcPad, go to GPS Preferences and verify your USB GPS appears in the drop down list. For devices with a COMxxx name, it will appear at the top of the protocol list with "COMxxx: (Device's Friendly Name)". For devices without a COMxxx name, it will appear at the bottom of the protocol list with "(Device's Friendly Name)".Once the name has been selected, either the device's COM port number or the device's friendly name will be saved to ArcPadPrefs.apx file inside the My ArcPad folder in My Documents. Whilst this is a major step forward, it's still a work in progress. ArcPad doesn't yet support the Garmin binary GPS format with work still progressing in this area. 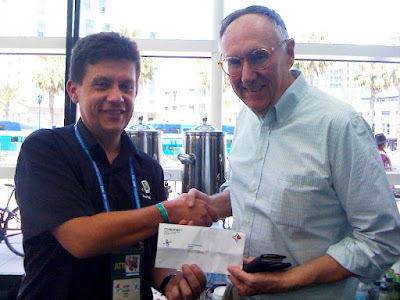 ArcPad's Real-Time Use in Disaster earns award. The service pack addresses some specific issues from the ArcPad 8 release. It includes a number of bug fixes and new developer samples. For a complete list of issues that had been addressed in the service pack, please see the ArcPad 8.0 SP1 Readme file. ArcPad is being featured at the ESRI Homeland Security GIS Summit because of it deployment during the devastating February bushfires that swept throught 220,000 hectares of Victoria, Australia . Stg. Barras was Situation Unit Leader , tasked with overseeing the GIS field data collection following "Black Saturday". As well as the initial Missing Persons searches, GIS and Arcpad in particular were used for the coronial searches of 5,781 properties. Magellan® Professional Enriches MobileMapper™ 6 Offer With Post-Processing Extension For ArcPad 8. After some time with ESRI UK , Gareth Walters has decided to return to God's own country. We are fortunate that Gareth has chosen to join the ArcPad team and bring his first hand ArcPad experience with Local Government and with customer support assistance through system design and software implementation to enhance our testing and user experience programs.